When you say “I do”, getting divorced may be the last thing on your mind. 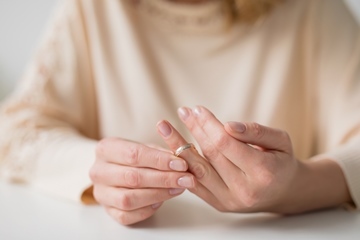 A divorce can be stressful and confusing for couples and families and there is no easy way to get through the legal process or to recover emotionally. We take you through the process and share some tips on how to survive this emotionally and financially taxing time. A divorce is a legal separation of a couple. If you have a civil marriage your divorce will be dissolved using the Divorce Act. Marriages in terms of African Customary Law are ended using civil or customary law. This means that the marriage will be dissolved using the Divorce Act but certain traditions may apply. For instance, a wife may need to pay back a portion of the lobola. Traditional Hindu and Muslim marriages, however, are dissolved using rituals of religion. Who qualifies for a divorce? There has been an “irretrievable breakdown” of the relationship, which means that you and your partner can no longer live together and there’s no chance of you resolving the matter. You have not lived together for a while. One partner cheated on the other. One partner left the other. One partner abused the other. You no longer love each other. You can get a divorce if your partner has been in a mental health facility for at least two years and doctors don't think they will ever recover. Your partner has been unconscious for at least 6 months and doctors believe they will never recover. You may be concerned about custody of your children or your property. So, if you are considering a divorce, get help from a lawyer who specialises in divorce or a clerk at a High Court in your area. There are many rules on divorce. 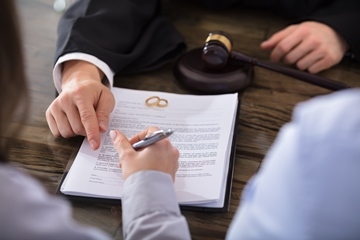 Your marriage agreement may influence your divorce process. For instance, if you're married in community of property, your shared property will be divided equally between you and your partner. For more information you can contact the High Court, NGOs like Nicro, the University of the Western Cape Community Law Centre, the Southern Divorce Court or the Family Law Clinic. Your official South African identity document. The court or law firm will provide any other documents. When you apply for a divorce, you will need to get a summons, a document that orders you to be at court. There may also be a divorce settlement attached to the summons. There are 2 types of divorce; uncontested/unopposed divorces and contested/opposed divorces. Uncontested divorces are easier because both parties agree to the divorce and the divorce settlement. Visit the High Court or a Family Court in your area. Ask a clerk for help with a summons, which will have the reasons for your divorce, personal details, details on custody of children and property. You will need to attach a stamp and pay for it. You will need to make copies and issue the documents to the clerk. He/she will sign it and give a reference number. You will need to give the original copies to the sheriff of the court. The clerk can help you find a sheriff. The sheriff will deliver the summons to your partner. The summons will have a date by which they can counter-claim. 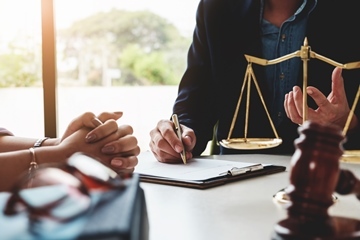 If your spouse agrees to the terms and does not counterclaim, your divorce will be added to the high court roll and you will appear in court. The plaintiff (the person making the case) will appear in court where a judge will ask questions to confirm information and may end your marriage. If your partner, however, disagrees with the terms in the summons, they'll counterclaim. He/she will have to create a document with their defence. You will have a trial. Be prepared to provide documents that will be used during the trial. You will appear in court and may need witnesses to help your case. The judge will listen to both sides and conclude your marriage based on the information they've read and heard. Mediation is when a third party, that has a legal background, helps you and your partner reach an agreement. The mediator will listen to both sides and give possible solutions. They will help you to reach an agreement on custody of your children and dividing your property. You will write a settlement, with their help, and sign it. One partner will be the defendant and the other the plaintiff. The defendant will receive the summons and settlement agreement. The plaintiff will go to court and request to have the case added to the high court roll. When the case is added, the divorce will be concluded. You can get a divorce on your own. There are many law firms that offer online services that can help you get a divorce. They will assist you with legal documents and the divorce process. A default divorce is similar to an uncontested/unopposed divorce. This works when your partner may not respond at all to the divorce. Your partner will receive a summons with a date. The date is a time frame for them to respond. If they do not respond, you can apply to the High Court, to add it to the roll. The court will decide on his/her behalf and end your marriage. During your divorce, you may experience many emotions. You may not experience all of these emotions, but get help from a counsellor to help you work through them. During this stage, you may deny what has happened to you and pretend to be "fine" or believe that you're "okay". If you have bottled up your feelings, you'll experience anger. This stage often follows denial as you begin to realise what's happened. You may blame your partner or be angry at yourself. "If only I could go back and do that differently". These feelings leave you feeling guilty as you may wish you had done things differently. This is a dangerous stage and can last for months or years. You can lose all hope and feel that there is no point to life. When you accept things, you will be able to move on. This only happens after you have received help. You do not need to get through your divorce on your own. There are many organisations and qualified people who can help you. Try Families South Africa (FAMSA). The organisation is an NGO that deals with divorce counselling and provides support for families. You can contact them on 021 447 7951.